There is no denying how useful stamps can be in various settings. From offices and warehouses to classrooms and craft rooms, stamps allow you to save time and energy while still communicating important information. With our collection of traditional stamp pads, find the perfect option for your favorite stamp. We feature some of the best brands in the industry for quality you can trust. Best of all, these stamp pads are refillable so you can use them again and again with your choice of ink! We offer a diverse range of traditional stamp pads to meet your needs. Choose from an array of sizes to find the one that will work best with your favorite non-self-inking stamps and hand stamps. With these traditional stamp pads, we have several colors to choose from including black, blue, brown, red, orange, pink, green, and other lively shades. We offer various ink types as well such as options safe for skin, options designed for different surfaces, and waterproof inks. When choosing traditional stamp pads, it is important to find pads housed within a sturdy case. There is nothing worse than buying high-quality ink for your stamps and having it dried out by the air getting in an improperly secured case. 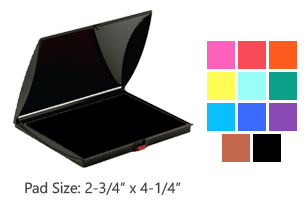 These cases are secure and air tight so your ink will last for as long as possible! 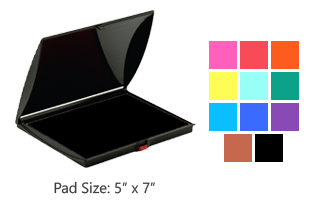 These reliable ink pads are made of durable plastic with a full close mechanism and feature felt pad surfaces for added quality. The impression given by these stamp pads offers a crisp, clean imprint with every use. Add one of these affordable stamping solutions to your stamp collection today! At Rubber Stamp Champ, it is our honor to be your source for all your professional and personal stamping needs whether for stamps, inks, or other accessories. If you have any questions about our products or custom engraving, our team would be happy to assist you in any way. Stamp Pad Size: 1-1/2" x 2-3/4"
Stamp Pad Size: 5" x 7"